Bun Masala is one of the favorite snacks among my children. 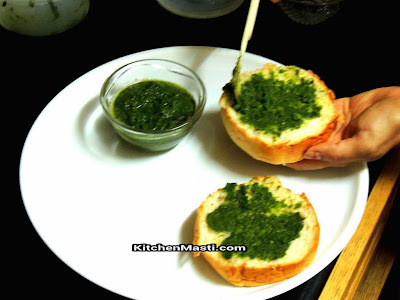 Compared to other chat items, its not that unhealthy.It is very easy to prepare.Once you have green chutney and sweet chutney ready, this snack can be prepared in a few minutes. At times when unexpected guests arrive, this dish can be prepared in no time. You can use burger bun or ordinary sweet bun..In case you use sweet bun,you need not add sweet chutney because the bun itself would be sweet. 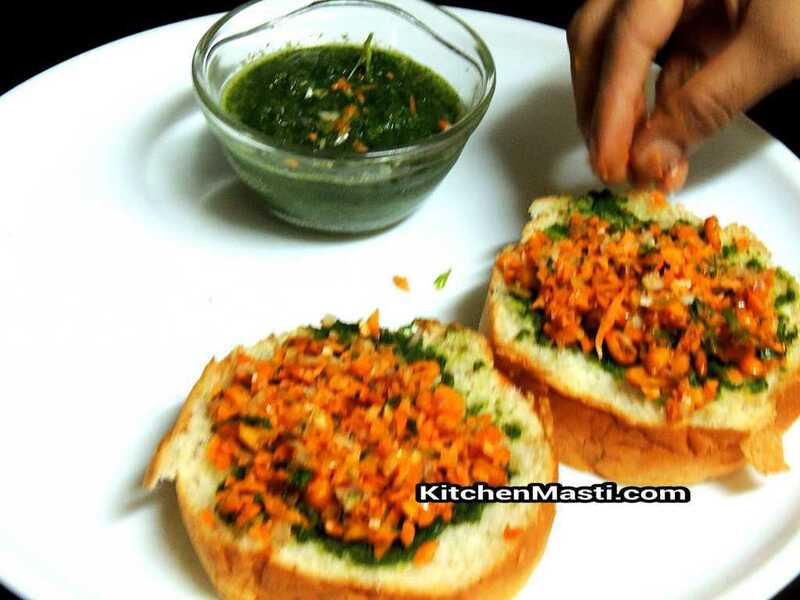 In order to prepare bun masala, you would need sweet chutney and kara green chutney. So totally, you would ideally require around 30 minutes to get Bun Masala ready. 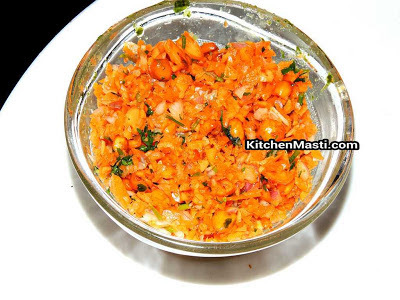 Grind all the above ingredients with minimum amount of water in a mixer.As far as possible, see to it that the chutney does not become too watery. It is always better to have a thick chutney and you can store the remaining chutney if any in the deep freezer also. Remove the tamarind pulp by adding hot water and wait for sometime. Now separate tamarind from its residue by squeezing it and then, discard the residue. Now, in a small vessel, heat the tamarind pulp, jaggery, deseeded dates (grounded in the mixer) . Heat it and let it boil for a few minutes so that the liquid becomes little thick. Your sweet chutney is now ready. Now let prepare the Bun Masala now. Chop the onions, coriander leaves, grate the carrot. Take a Bun and cut it into equal horizontal halves and keep it aside. Cover the other half of the bun and press it firmly. Your Bun Masala is now ready to be served !!! 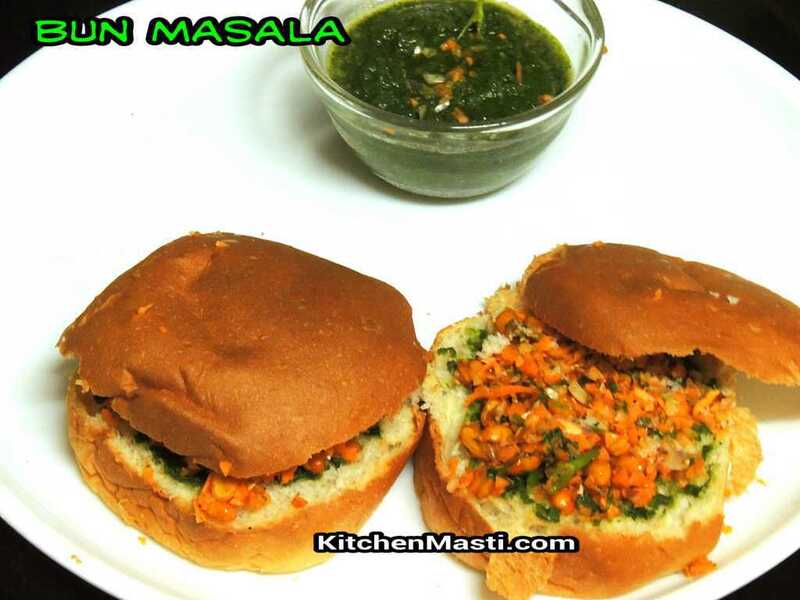 Use can use cheese slice or grated cheese along with these ingredients and serve them as stuffed Cheese Masala bun. This dish cannot be preserved for a long period because the bun will turn soggy due to the liquids used in the recipe. During birthdays this serves as a funky snack among the youngsters.